Phil Crampton’s Altitude Junkies has run Everest climbs from both Nepal and Tibet for 10 years and for 2018 he is making a radical change, returning to his roots. Phil began climbing Everest in 2001 thus is in a unique position to comment on the changing business of Everest plus the impact of recent crowds, government policies, and strategies used by other outfits to attract a wide range of climbers. Phil’s switch is the third guide company to leave Nepal for Tibet over the last several years. Is this the beginning of a movement indicating problems in Nepal or just a business decision? I’ve known Phil since 2008 when he was instrumental in helping me recover from botched logistics on an Everest North side climb. We went to the Southside that year but were waylaid by the Chinese antics related to the Olympic games. In 2013 I summited Manaslu with Phil and team, summited Alpamayo in Peru the next year plus was on his Everest team in 2016 for a Lhotse attempt. I interviewed Phil, who lives in Kathmandu, last year just before the 2017 season. He had decided not to run an Everest expedition for the first time in many years. Now for 2018, he is going back to Everest but switching sides after climbing from Nepal since 2009. His company, Altitude Junkies, has an incredibly loyal following. It is common for him to have 8 out of 9 repeat members on an expedition, almost all who have summited several 8000-meter mountains, including Everest with Phil. He is not a “guide” and takes it personally if you call him one. He expects his climbers to come prepared, be independent and ready to climb. No training at basecamp with his team, If you ask him to check your gear, he will scoff at you and suggest that you are on the wrong team! Phil is famous for his afternoon happy hours where attendance is mandatory, but drinking is not. I have spent many an hour in the dining tent visiting with the who’s who in climbing including Conrad Anker, Russell Brice, and others. His Sherpas are some of the best and loyal to a fault. He pays above-average wages, does not accept tips and keeps his promise that there will be zero surprises on his trips. Oh, and his prices are below average. He is asking in the low $40K range for his trip this year. So what is going on to bring Phil back, to climb from Tibet, not Nepal and what is his take on the overall Everest Inc. these days? Grab a beverage and enjoy. AA: In 2017, you took a break from Everest as we discussed in our last interview. You said the crowds combined with inexperienced members drove you away. With the North side now gaining momentum [link], are you concerned that the same thing will happen there? In 2017, a large Indian team of teenagers (Transcend) went and put 16 teenagers with 22 Sherpas on the summit. PC: 2017 was the first year in many I wasn’t actually climbing on Everest. We wanted a less crowded and more challenging 8,000-meter peak so we climbed Makalu instead. We had a great team of guys and girls and a beautiful peak, which presented new logistical challenges for me, which I enjoy. We had a total of 45 foreign climbers plus Sherpa on Makalu last spring. We had hoped to offer different 8,000-meter peaks in the future such as Makalu and Dhaulagiri but the draw of Everest stills commands most interest from prospective Himalayan climbers. The Sherpa that I work with year in year out enjoyed Makalu but they are now ready to get back to Everest, and I want my boys to be happy in their work. I personally think that the south side of Everest is at a point of no return in regards to crowds and inexperienced climbers on her flanks, and unfortunately I think it will only get worse. The new rule being introduced this spring that every foreign climber needs to be accompanied by a Sherpa guide will only add more people to the numbers on the mountain, but most reputable expedition companies already have a 1:1 Sherpa to climber ratio. The local Nepalese companies are now competing with each other, rather than with the foreign companies for members, undercutting each other with prices and therefore most of them are hiring inexperienced climbing Sherpa to take responsibility of inexperienced members. For those climbers whom know Everest well, it’s pretty much a known fact that members from Nepal’s neighbors are predominantly using the local companies services and getting themselves into trouble on the hill. The member base of the western expedition companies are still going to climb with a western guide and a company with a good track record, rather than going for the lowest cost. Transcend is an Indian company and they have figured out that there is a lot of business to be had with Indian climbers on Everest, so I expect them to have more Indian members in the future. I am not sure if the teenage team is going to be an annual event. Even back in the nineties and zeros, when there were large numbers of climbers on the north side, it never seemed to feel crowded, although it was somewhat a lawless mountain, in regards to theft of oxygen and some climbers generally behaving badly. The China Tibet Mountaineering Association pay close attention to what’s going on in Nepal and I do not think they will let the same happen to the north side. They have big plans to further promote their domestic Everest tourism with building a mountaineering center in Tingri. [link] They also do not keep releasing random press releases instigating new rules and regulations that ultimately tarnish the rationalization of the Nepal Government and the Ministry of Tourism and Civil Aviation. AA: Nepal recently announced new rules banning climbers with disabilities, solo climbs, increased insurance for Liaison Officers and more. Do you think this will drive more Everest climbers to Tibet? PC: I think they made a similar announcement a couple of years ago and nothing ever happened. Why increase the insurance for a civil servant who doesn’t show up at base camp anyway. Saying that, some of the LO’s do make it to base camp for a quick photo with the expedition leader before immediately departing to head back to Kathmandu. Most of the climbers on Everest these days are part of a large self-organized expedition or join one of the many commercial expeditions that operate on Everest. The majority of the commercial expeditions operate on the south side and only a handful on the north. 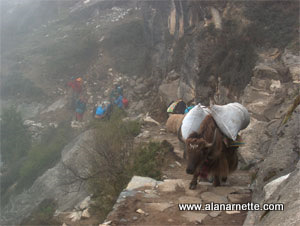 The local Nepalese companies prefer the south as they do not have to pay the CTMA the high cost Sherpa permit fees. Another factor is that most of the commercial expeditions on the south side use Sherpa who already live in the Khumbu region. This saves them on expenses as their staff members are already close to base camp, whereas travelling to Everest north base camp is expensive travelling from Kathmandu and return. AA: So, I take from your answer that one day we may see the Nepal side dominated by Nepali owned companies and the North by collations of loose knit independents along with a few commercial operators? PC: I still think you will have the main players of the commercial expeditions, such as Russ and Guy with their respective guided climbs, operating on Everest south each spring in the future. Some of the western companies that offer a Sherpa led expedition may see a drop in numbers eventually as prospective members believe they are offering the same services as the local Nepali companies. The reality is that these western companies have a lot more experience on Everest than the newer local companies and more importantly, a veteran western Everest leader running the show, which makes a huge difference to the outcome of an expedition and safety on the hill. Good leaders and guides cost money and their salaries have to come from somewhere. The cheapest price is not the best way to go on Everest I believe. There will be a lot more Nepal companies on the south side of Everest in the future as the government will not regulate who can organize an Everest expedition. If you can pay the permit fee then you are good to go as far as the ministry are concerned. I think the Tibet side of the mountain will stay pretty much the way it is, possibly less climbers if permit prices keep increasing. AA: Are the Liaison Officers on the Nepal side really just a political payback, never designed for real value-add to the climbers? PC: I would call it a payback for all those folks at the Ministry of Tourism. It’s an antiquated rule from way back when, but them folks who regulate the permits love the cash it brings in. An LO can make half a years salary of a government minister by not showing up at base camp. It’s not just the LO fees that make additional income for the folks at the Ministry, there are many other bribes that have to be paid to make sure we are granted our permits. It’s just the way it is and we all have to play the game. AA: The Chinese Mountaineering Association require Chinese Nationals to have a summit of an 8000-meter peak before attempting Everest. Is this a good idea and should Nepal implement something similar to increase safety and reduce crowding? PC: It will never happen [in Nepal], as a lot of the modern day Everest climbers have never climbed on an 8,000-meter peak before, not just the Chinese climbers attempting the peak from the south. Nepal is a poor country and the climbing permit revenues are a huge boost for their economy. I think it would be a fantastic idea to implement the CTMA rule in Nepal but then you would only have experienced mountain guides and climbing Sherpa present with a handful of climbers who could be bothered to climb Cho Oyu or Manaslu prior to going to Everest. I ask all my climbers to have the necessary experience to climb on my Everest team, although I like them to have previous 8,000-meter experience, I do not always require this if I have personally climbed with them before and know they are physically and technically able to climb Everest safely. AA: China has fewer rules than Nepal on their side. How much does that impact your decision to climb from that side? PC: China enforces the age minimums and maximums so there’s not too many 13 year or 85 year olds knocking around base camp. The Liaison Officers who are at base camp for the full duration of the expedition are usually the same two guys that run things each year and they are good at it. The head guide from the Tibet Mountaineering Guide School tells the various teams what time they are to depart on their summit push if it’s crowded at high camp. This is a very simple technique of staggering the different groups departure to avoid any congestion on the route. Why they never did this on the south I do not know but it would be better than everyone leaving at the same time. AA: The Tibet side used to have the reputation as the low-cost – wild side with solo climbers who often climbed without oxygen – many of whom died. Now a couple of operators are carving a niche with expeditions costing around $100,000 – unlimited oxygen, in short timeframes, etc. What’s going on? Are the lack of rules from the Chinese encouraging this wide range of offerings, or is there something else going on? PC: I still find it hard to believe someone would drop that amount of money for a shortened Everest expedition. I do not believe in the “home acclimatization tent” as I think for it to work you would need to be in it 24 hours a day, 7 days a week, for several weeks and fly inside it over to Nepal to start your expedition. I know some climbers swear by it but I think it’s more of a marketing tool than a medical one. The body needs quite some time to allow the red blood cells to double to be able to carry more oxygen. A tent on the top of my bed at home is not going to do in my honest opinion; only being at a certain altitude 24-7 will help this process. For the longest time oxygen was used a 2-liters per minute flow rate on summit day and then slowly it started to increase but so did the summit success statistics, but there were more climbers attempting the summit, so the figures may be misleading. Now I am hearing of 6-liters, even 8-liters per minute which I think is not really necessary. A four-liter bottle of oxygen will last on average for 8 hours at a flow rate of 2-liters per minute and 4 hours at a flow rate of 4-liters per minute. If a climber is going to use 6 or 8-liters per minute they are going to need a lot of bottles. Who’s going to carry all these bottles, the Sherpa of course, but it’s creating more load carries for them, therefore exposing them to more danger. The reason I had two Sherpa per climber on my Everest south side expeditions is so that my Sherpa would make half as many carries through the ice fall as they had double the manpower than most other expeditions had. Even though they carried less they would still get paid as if they carried double what they actually did so they would not be hurt financially. It now seems as if helicopters will eventually eliminate all the carries through the icefall. This subject is a very sensitive one with mixed opinions between the various operators on the south I’m told. Traditionally Everest from either side of the mountain has been a 60-day expedition from start to finish. As the weather is changing on Everest and summits are happening later than in previous years for the most part, plus the advancements of weather forecasting and a better understanding of the acclimatization schedules needed for Everest, I think the 60-day expedition is a thing of the past. The north side has the added benefit of allowing a later summit in May due to the fact that there is no melting icefall to descend. I think in a few years most Expeditions on the north side will be around 45 days, whereas the south will be slightly longer due to the trek to base camp. Some teams have done it in 30-days on the north but everything has to fall into place in regards to weather conditions, personal health, acclimatization, fixed ropes in place, etc. If I were going to drop $100K for a climb of Everest I would ask for a few contingency days in case things don’t work out the way my employer back home would like it to. AA: As you note Phil, given there is no Icefall melting to contend with on the Tibet side, would you stay into early June to summit; assuming the monsoons cooperate? PC: I am purposely starting my expedition in late April so we have the option to go for the summit in late May or early June I need be. I would prefer late May but I will stay as long as it takes within reason, although I would rather be done and back in Kathmandu before mid June like Conrad and Leo did. AA: Several operators have used the press to promote their business by demonizing the Nepal side even going as far as saying it is “immoral to guide on the Nepal side” due the dangers of the Khumbu Icefall. Clearly the last few years have been deadly and tragic with the serac release and earthquake killing over 30 people. Do you agree with these operators that climbing on the Nepal side has too many risk to both staff and members? PC: The icefall is obviously a dangerous place to be, especially later on in the season and with the increased temperatures experienced in the Himalayas due to climate change. Climbers forget when they have made their last climb through the icefall the Sherpa still have to go back, some several times to retrieve the gear from higher on the mountain. Climbers will helicopter out of base camp or start the trek to Lukla while the mountain is still be climbed by the hard working Sherpa from various teams. I think both the north and the south have their dangers, but I don’t think it’s immoral to ask a Sherpa to work to be able to feed his family. A lot of the Sherpa do not have the choice on which side they climb (my Sherpa chose the peaks we climb). There is always the choice for a Sherpa to avoid Everest completely and work on the lower trekking peaks such as Island and Mera Peak. Everest is a dangerous place and some of us have to work there year in year out. It’s the choice we make, regardless of being a westerner expedition leader or a Sherpa. AA: Which side do your Sherpas prefer? PC: I would say in the past they prefer the south, as it’s closer to their homes, the route is easier (in my opinion), Dhal Bhat’s available everywhere (local dish), and they have the camaraderie of another 300 plus Sherpa on the hill during the season. I think the talk of helicopter rescues being available on the north side in the future was a big factor in the Sherpa and I returning to the north side. To be honest, ask any Sherpa which side he prefers and he will probably reply, the side that pays more. AA: Phil, you have a rich history on both sides now with 14 expeditions total on both sides starting in 2008. I have heard you say the North is harder. Why? PC: I first went to Everest in 2001 but my first Altitude Junkies expedition was in 2008. I started on the north side and the only reason I had the chance to climb on the south side was because the north side was closed due to the Olympic Torch relay in 2008. I now have seven expeditions to the south and seven to the north, so I think I can answer your question with some experience. This is a big debate, which side is harder. Those climbers I know whom have climbed both sides all agree that the north is harder. Perhaps it’s the weather, the relentless wind at base camp or the mixed terrain up high, it’s hard to pinpoint, but I think it’s a harder summit day and a harder expedition in general. I’m not saying the south side is easy, Everest is not easy despite what the media says, but there’s something about the north, which is more edgy than the south. High camp on the north is pure brutal, it’s like sleeping just below the Balcony on the south. AA: Would you recommend any different preparation or training for a member who is climbing from Tibet instead of Nepal? PC: I think the physical training should be the same but plan on being more self-sufficient in regards to looking after your self in the high camps. Even the Sherpa find conditions rough on the north side so it’s a good idea to have all you pre-planning dialed in for clothing systems and camp management in place. I think another good habit to get into is don’t be so reliant on technology as sometimes things don’t quite work out in this department, especially at base camp. If the internet is not working, deal with it, it’s not going to be the end the world if you can’t update your Facebook page. Base camp cell service on both sides of the hill is sporadic to say the least. Remember where you are. AA: China charges $3,300 per Sherpa to climb on the Tibet side? Obviously, this makes the climb more expensive. Why not use Tibetan or Chinese climbers to support your members? PC: I have a lot of history with the Tibetan guides as I lived and taught in Lhasa, Tibet for quite some time at the Tibet Mountaineering Guide School. This was a long time ago when the school first opened in 1999. When the school was in it’s early stages the students would be hired by some of the Western commercial expeditions operating on Cho Oyu and Everest respectively and the funds received for their services was put back into the operational budget of the school. The students completed a three-year program with their tuition, room and board all provided and they were not asked to pay a penny, so the budget had to come from somewhere. Now these guys and a few gals, are busy fixing the ropes on Everest and Cho Oyu in the spring and fall respectively and working for the large Chinese expeditions that are present each year on these peaks. AA. So Tibetans are not available as they are bought up by Chinese expeditions? PC: There are only so many Tibetan Guides available and the majority of them work for the numerous large Chinese expeditions in attendance on Everest or they are fixing ropes. I think the present situation works well as this way they are not competing with the Nepal Sherpa for work on the western expeditions. AA: Any strategy to manage the expected crowds on the Tibet side this year? I am not hearing of too many new expeditions planning to be on the north side in the spring so I assuming it will be the same as last year in regards to numbers of foreign climbers. I think there may be a small increase in numbers on the south side, especially after 2017 was considered a good year and those folks with permits honored from the 2014 season are running out of time to use them with 2019 being the last year. I plan to enter Tibet later than most teams as I am looking to summit after May 25th if possible. It’s warmer then, there are no crowds and we will hopefully have the mountain to ourselves. Conrad and Leo made the summit real late in mid June in 2005 or 2006 I think. I prefer to run a smaller team on the north side, ideally 6 climbers, a 1.5:1 Sherpa to climber ratio, and myself as the expedition expediter. I think we have more chance of success with this sized team and a more personable expedition rather than an expedition with 45 climbers, where it’s hard to remember everyone’s name. AA: AJ has always offered a fair price (one price, no tips, clear expectations) for what I consider to be an exceptional program (I have climbed with AJ three times). Should your members expect the same first class service this year on the Tibet side? I like my Everest teams to be comfortable but I refuse to take a flat-screen TV to base camp. An Everest expedition is a great opportunity to get away from the real world for a month or so. I ask my team members to enjoy each others company and get to know each other, engaging in conversation rather than watching action movies after dinner. Our climbing Sherpa and kitchen Sherpa will be under the directorship of Pasang Ongchu Sherpa and Da Pasang Sherpa respectively, so many of our repeat climbers will be happy about this. We are not the cheapest or most expensive Everest expedition out there but I like to think we charge a fair price for a great service. I am a big believer of being transparent about my expenses to run an Everest expedition and I refuse to advertise a low price and then ask the member for all the additional Sherpa summit and carry bonuses and kitchen staff gratuities at the conclusion of the expedition. 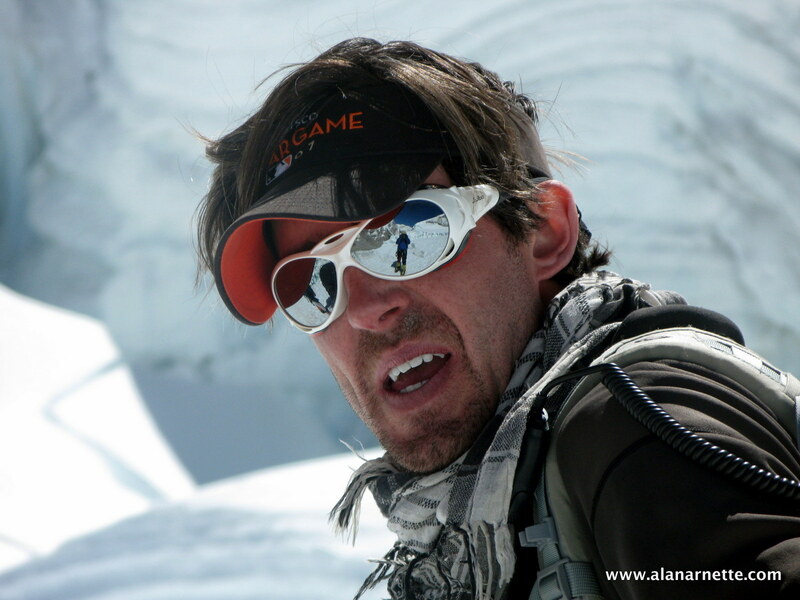 AA: Thanks Phil for your candidness and helping our readers understand both sides of Everest a bit better. Any final thoughts? PC: I hope all your readers who are heading to Everest in the spring have a safe and enjoyable climb and come back home with some amazing memories. These are some excellent photos from Jamie McGuinness of Project Himalaya of the Tibet side of Everest. Best of luck to Phil and team on Everest this season. You can follow him on the Altitude Junkies website. Alan – Another insightful interview. Thanks for all the excellent reporting you do on the Himalaya!